The purpose of this chapter is to examine the state-of-the-art of Knowledge Assets Management (KAM) in the energy industry, reviewing both the literature and the practice of KAM initiatives. Particular attention is provided to the renewable energy sector and to the Small and Medium Enterprises (SMEs). It emerges that most of the literature is focused on big companies and little attention is paid to the renewable energy sector. It emerges that some organizations, especially in the oil industry, are seen as leaders in KM practice. On the other hand, SMEs operating in the renewable energy industry are not aware of the relevance of KAM and then do not address explicitly KAM initiatives or projects. The research reveals that small firms do indeed manage knowledge assets informally as part of their normal activities, without using the terminology and concepts of knowledge management discipline. Future energy development, providing for the world’s future energy needs, currently faces great challenges. These include an increasing world population, demands for higher standard of living, a need for less pollution, and a possible end of fossil fuels. Without energy, the world’s entire industrialized infrastructure would collapse: agriculture, transportation, waste collection, information technology, communications and much of the prerequisites that a developed nation takes for granted. A shortage of the energy needed to sustain this infrastructure could lead to a world catastrophe. This translates in developing energy technologies that are cost-efficient, have practical applications, provide greater safety and are environmentally sustainable. In order to achieve these aims, energy industry companies are increasingly asked to create and sustain new competitive advantages, especially in situations of rapid and unpredictable market and normative change, pressures about environmental issues, and increase of energy demand from developing nations. 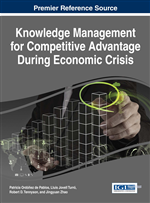 It is believed that a competitive advantage in today’s economy depends more and more upon the way companies manage their know-how - in terms of their knowledge and intellectual assets - and how effective and efficient their knowledge management processes are applied to accumulate, articulate, codify, and use knowledge and intangible assets to create value and enhance performance over time (Teece, 1998; Boisot, 1998; Carlucci et al., 2004; Wiig, 1997) . The aim of this chapter is then to examine the state-of-the-art of Knowledge Assets Management (KAM) in the energy industry, reviewing both the literature and the practice of KM initiatives. Particular attention is paid to renewable energy sector and to the Small and Medium Enterprises’ (SMEs) KAM practices. It emerges that most of the literature is focused on big companies and little attention is paid to renewable energy sector. Traditionally, the nature and the structure of the industry determined that the companies have attributed importance to KAM, even if this has not represented their priority, dealing with other more stringent managerial issues. However, more recently, it is emerging a great attention on the role and relevance of the KAM to support and drive the improvement of organizational performance into the energy industry. In particular, some good practice of KAM in the energy industry can be found in the oil industry. This is mainly due a change in the characteristics of the energy market, and to the increase of the competitive pressures related to the international liberalization processes as well as to the need to gain major efficiency and productivity levels, and to a strong focalization on environmental impact issues related to energy exploitation and utilization. On the other hand, SMEs operating in the renewable energy industry, are not still aware of the relevance of KAM and then do not still address explicitly KAM initiatives or projects. In small businesses, knowledge assets are managed implicitly, i.e. without the use of formal approaches and tools. The research has revealed that small firms do indeed manage knowledge informally as part of their normal activities, without use of the terminology and concepts of KAM. Insights highlight the need to raise awareness and stimulate debate and applications about KAM in energy industry, particularly in the SMEs of renewable sector. The chapter is organized in the following parts. First, we briefly present the energy industry structure, highlighting specifically the increasing importance of the alternative and renewable sector and its main challenges. Following, we introduce the basic concept of knowledge and intellectual assets management. Then, we explain the methodology of our systematic review. Through the review of the literature, two main research streams emerge. The first research stream is about KM in SMEs. The second research stream is about KM in energy sector. Finally, some directions for further research are provided.